Michael: "Toby is in HR, which technically means he works for corporate, so he's really not a part of our family. Also, he's divorced, so he's really not a part of his family." Dwight: "I have been Michael's number two guy for about 5 years. And we make a great team. We're like one of those classic famous teams. He's like Mozart and I'm like... Mozart's friend. No. I'm like Butch Cassidy and Michael is like... Mozart. You try and hurt Mozart? You're gonna get a bullet in your head courtesy of Butch Cassidy." Michael: "Yes, I was the first one out. And yes, I've heard "women and children first." But, we do not employ children. We are not a sweatshop, thankfully. And women are equal in the workplace by law. So if I let them out first, I have a lawsuit on my hands." Pam: "Last year, my performance review started with Michael asking me what my hopes and dreams were and ended with him telling me he could bench press 190 pounds." Michael: "Would I rather be feared or loved? Um... Easy, both. I want people to be afraid of how much they love me." Michael: "That is a perfectly good mini Christmas tree. We are going to sell that to charity because that is what Christmas is all about." Jim: "The Albany branch is working right through lunch, to prevent downsizing. But, Michael, he decided to extend our lunch by an hour, so that we could all go down to the dojo and watch him fight Dwight." Michael: "New York City is like Scranton... on acid. No... speed. No... steroids." Michael: "New York, New York. City so nice they named it twice. Manhattan is the other name." Michael: "Why do you keep a diary?" 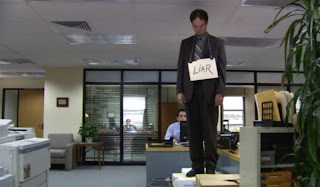 Dwight: "To keep secrets from my computer."